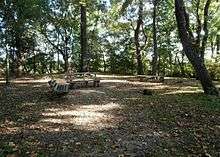 Ingomar Mound is the sole remaining feature of a large ceremonial center of the late Mississippian Period of cultural development. A temple mound, it represents a type rarely found in the northeast section of Mississippi. It is also significant because of its potential for the testing of aboriginal settlement pattern hypotheses, such as the system environments theory of Clay (1976) and the spatial efficiency theory of Steponaitis (1977), and for the development of new theories and models." ↑ "Ingomar Mound [22-Un-500]". MDAH Historic Resources Inventory Fact Sheet. Retrieved 23 October 2016.